The present article proposes that the variety of existing managerial practices collectively described as “customer relationship management” can be organized and coordinated into a logical sequence of goals and methods that is more effective than performing them in an uncoordinated fashion. The model proposes that managers have five distinct but interrelated goals: customer acquisition, customer retention, customer development, customer consultation, and customer conversion. Although each goal can be achieved using distinct and well-known marketing practices, the model integrates the practices in a temporal and logical order in which achieving one goal contributes to achieving other goals. Integrating the procedures and technologies used at each stage results is a synergistic effort that should benefit companies and can guide empirical research. Every business desires to create profitable relationships with customers. In fact, some might argue that one of the most valuable assets a firm has is its customers; and it is well established that the economics of customer relationships yield lower costs and higher margins than pursuing one-off sales (Gronroos, 1997, p. 7). To achieve these economies, firms are recommended to follow the practices summarized by the term “customer relationship management” (e.g., Buttle, 2009). As is often the case, however, when new ideas appear in the business world, there is often an initial period of uncertainty with regard to their meaning. This is certainly the case with CRM, which is sometimes understood differently by both practitioners and by academics alike, and is taken to refer variously to techniques, strategies, and business philosophies. Bringing order to this confusion is a first step in its optimal application. Payne and Frow (2005) carefully document the variety of ways in which firms define and implement CRM. Their research highlights the tangle of CRM definitions and practices, some of which bear little resemble each other, but which share the same rubric. 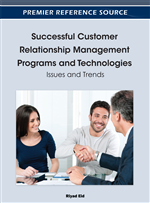 Based on their study of business practice, Payne and Frow (2005, p. 168) argue that CRM is commonly associated in the minds of managers with (1) technology, (2) relationship building, and (3) customer orientation. On this basis, they propose a continuum of definitions ranging from the narrow specification of technology and solutions to a middle ground of “customer-oriented technology solutions,” and finally to a strategic perspective for managing customer relationships to create shareholder value. Such comprehensive and consistent definitions are necessary in order to avoid piece-meal and inconsistent implementation by practitioners and to promote effective research and teaching. The present article does not propose yet another definition of CRM, but instead takes as given the current variety of understandings and practices and builds on existing CRM discussions from both academics and practitioners. First, the article accepts as given the economic and financial justification for adopting CRM strategies. Second, as a working definition, the article assumes that CRM is a cross-functional, process-oriented strategy that develops long-term customer relations through personalization (one-to-one marketing) and use of technology to analyze and understand customer preferences. Finally, it accepts the distal goals that CRM seeks to create customer and shareholder value. What is lacking, it proposes, is the notion that as a strategy, CRM also can also be organized and discussed in terms of five specific proximate goals that coordinate specific strategic initiatives. The variety of practices and techniques under the CRM rubric clearly has different goals. Sequencing them and linking the techniques in terms of these goals can be both a profitable way to implement an overall CRM strategy as well a suggestive way to guide research and teaching.